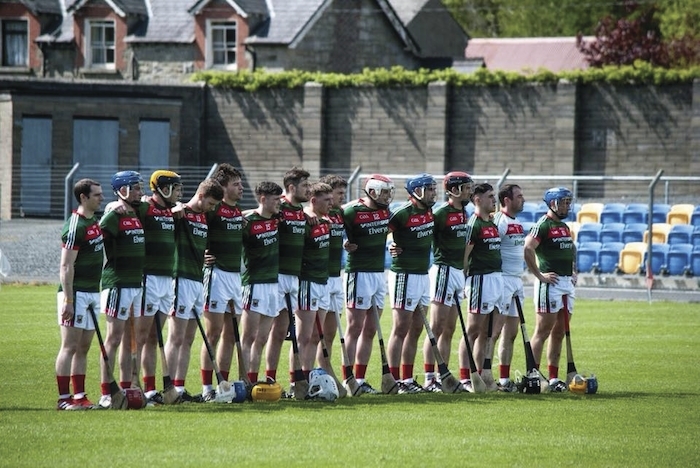 The Mayo senior hurlers are facing into a must win game tomorrow. Photo: Mayo GAA. Just like last year, Mayo need to see off the challenge of near neighbours Roscommon to maintain their status in the Christy Ring Cup for next season. Both sides sit pointless at the bottom of group one of the eight team competition - with each of them having been defeated by Wicklow and Kildare in their opening two fixtures - leaving everything to play for in terms of survival in the competition when they meet on Saturday in Athleague at 3pm. A fortnight ago Mayo came agonisingly close to picking up two points when they hosted Kildare in James Stephens Park in Ballina - with the Lilywhites just edging out Derek Walsh's side on a score of 2-14 to 1-15. Mayo got off to a cracking start in that game - going into an early 0-6 to 0-0 lead inside the opening 10 minutes, before they let Kildare back into the game with the Leinster men reeling off their own half-a-dozen minors over the next dozen minutes. Mayo did manage to push themselves back into a two point lead on a score of 0-10 to 0-8 at the break with Kenny Feeney and Keith Higgins leading the charge on the score board. The second half was another pulsating encounter with Shane Ryan's second half goal keeping Kildare in check with Mayo's point scoring and when Jack Sheridan pulled on the sliothar to grab his side's second goal late in the day it looked like Joe Quaid's men were home and hosed. But Mayo rallied with Keith Higgins finding the back of the net almost straight away to close the gap, but Mayo could not find the goal they needed to salvage a draw. Mayo's opponents on Sunday rallied in their second outing against Wicklow and pushed the Garden County right to the pin of their collar. The primrose and blue clad men had been well beaten by Kildare in round one going down 4-26 to 1-10 - but they really upped their performances in the last round going down by just six points against a Wicklow side that had given Mayo a bit of a trimming in round one. Last year both sides met in the relegation final of the competition with Mayo running out 1-25 to 2-12 winners in Carrick-on-Shannon (Roscommon avoided relegation from the competition after the GAA re-jigged the hurling championship structure, which saw the introduction of the Joe McDonagh Cup as a tier between the Christy Ring Cup and the Liam McCarthy Cup ). Mayo will be looking for big games from Kenny Feeney, Conor Daly, David Kenny, Shane Boland, and Donal McGreal on Saturday as they fight to retain their Ring status, they will have to be on guard against Danny Glynn who hit 10 points for Roscommon in their last outing and Naos Connaughton their experienced full forward.